Joshua Creek is the largest of Halton’s urban creeks. 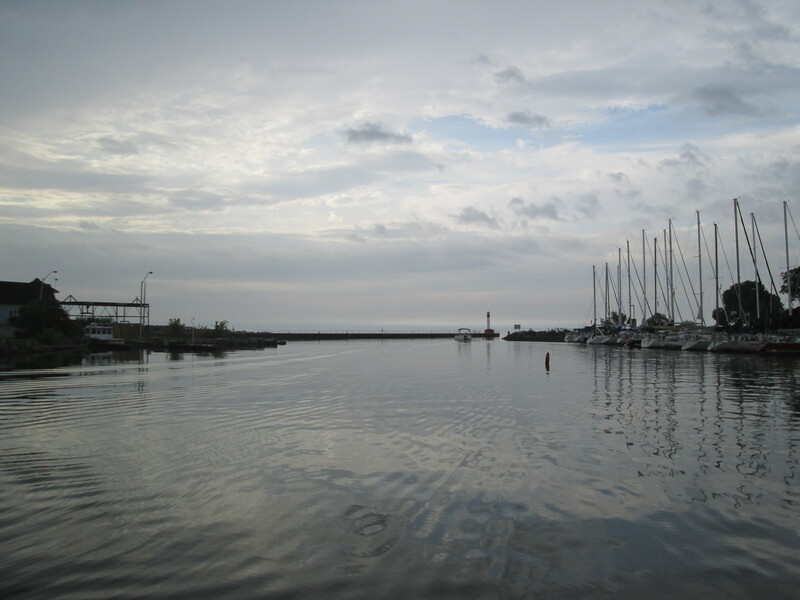 These 14 watercourses run through Oakville and Burlington but have their headwaters and the entire stream confined within the city. Joshua Creek has it’s headwaters near the 407 and runs close to the border between Mississauga and Oakville. The creek passes through fully engineered sections with armour stone or gabion baskets while other parts flow through naturally forested areas. The sections on the northern reaches still flow through open farmland and the creek boasts one of the best water qualities in the county. The hike roughly covers the section of Joshua Creek highlighted in blue on the 1877 County Atlas below. Note the rows of apple trees shown on the map between the creek and the lake. Some of these orchards remain and can be seen as you walk along the creek. A set of stairs descends from a trail linked to Breton Close where there is free parking. These stairs come with a “V” channel on one side to make it a lot less bumpy if you wish to bring a bicycle onto the Joshua Creek Trail. The section of Joshua Creek near the stairs has been plated with armour stone but much of the creek from this point to Lake Ontario has been left in a more natural channel. American Beech is one of a half a dozen species, mostly oak, that can hold their leaves over the winter. These beech trees can live for 300 years and tend to grow slowly, taking 20 years to reach 13 feet in height. In Ontario they are late succession trees that form a part of the Beech – Maple climax forest. Cleared land will progress from low bushes like sumac and hawthorn to ash and birch trees. Maple, Beech and Oak trees are signs of a mature forest. Beech trees can reach 100 feet tall and the canopy can spread to 70 feet wide. Small beech trees grow in several stands along the creek. Emerald Ash Borer is a significant problem in Joshua Creek and many of the trees have had to be removed. This opens up the canopy and will allow the beech trees to have their moment in the sun. Footprints leading up to this fallen tree indicate that humans and the local wildlife both use it as a bridge. It is certainly wide enough but being wet and slippery precluded crossing on this wet morning. The lower trail was muddy in places, unlike the main trail up on the top of the ravine which has been treated to chipped up pieces of Christmas trees. Snowdrops are native to Europe and the Middle East. They were brought to North America as an ornamental plant for use in gardens. Non-native plants can be divided into two categories, those that need human intervention to survive in their new environment and those that don’t. The ones that can survive on their own can further be divided into naturalized and invasive. Naturalized plants can survive on their own and in time become part of the local flora. Those that are invasive will crowd out native plants and often release toxins into the soils to prevent the growth of competing plants. Snowdrops are considered to be naturalized rather than invasive because they don’t spread rampantly and they fit in with the local habitat. Beavers once filled the rivers and streams of Ontario. Trapping for the fur trade had virtually eliminated the beaver from Southern Ontario by the 19th century. Beaver moving back into urban centres has become more common over the past few decades as water qualities have been improved. New York City, for instance, saw its first beaver in over 200 years in 2007 and High Park in Toronto now has a lone beaver living in Lower Duck Pond. Beaver can be very destructive and the trees along Joshua Creek show significant damage from the local beaver. At one point we saw a place where it appears that the beaver have built a lodge under the roots of a tree along the embankment. Further downstream we found the place where the beaver have built their dam. The dam has been breached by recent high water but they won’t take long to repair it. 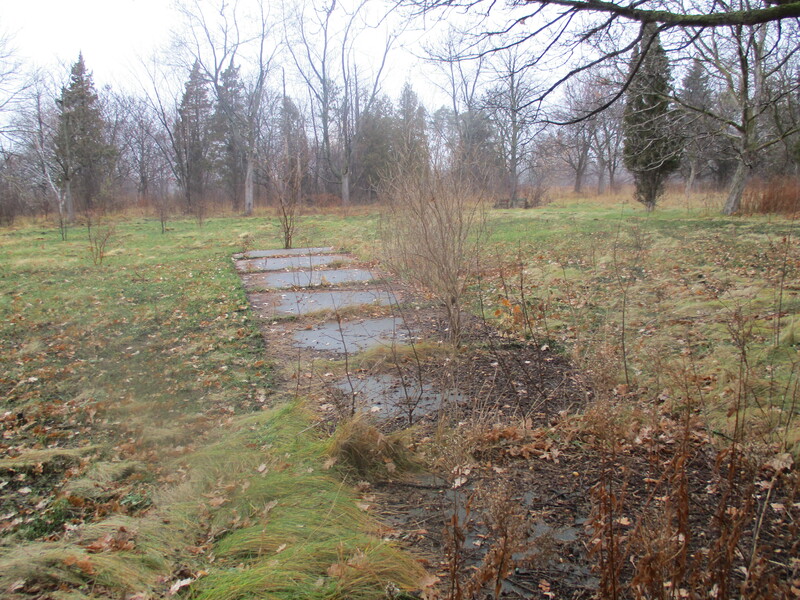 Several foundations line the creek from the days before the estate lands were divided for smaller homes. The cover photo shows a set of stone stairs that lead down to the edge of the ravine above the creek. The steps suddenly end with a long drop into the water. Whatever once stood at the end of that stairway is long gone as is the building that once stood on the foundation below. 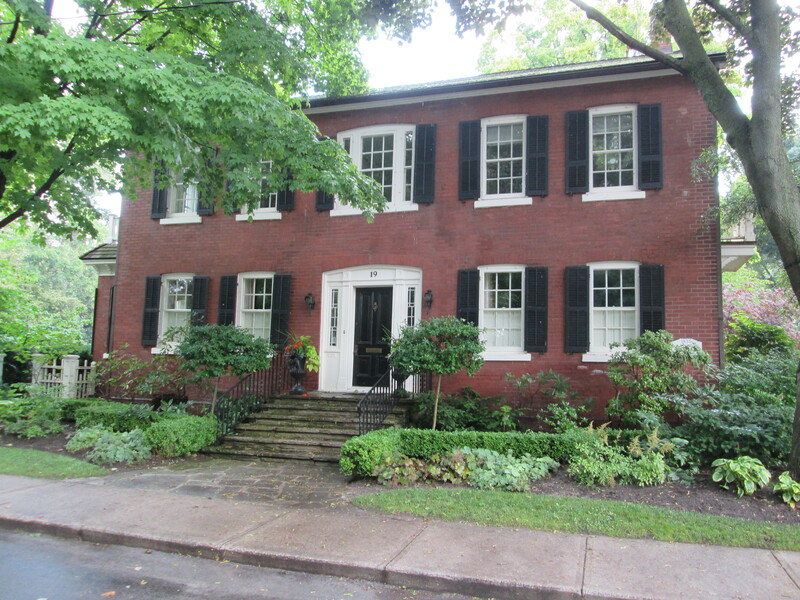 Charles Powell Bell and his wife Kathleen Harding moved into their estate home near the mouth of the creek in 1938. 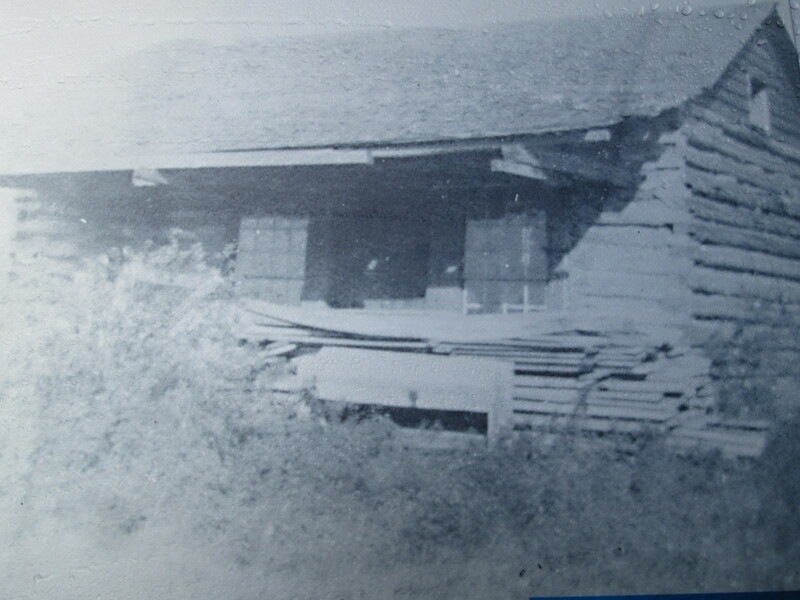 The house and garage originally stood on 60 acres and had the early name “Fusion” although it was usually known as Harding House. 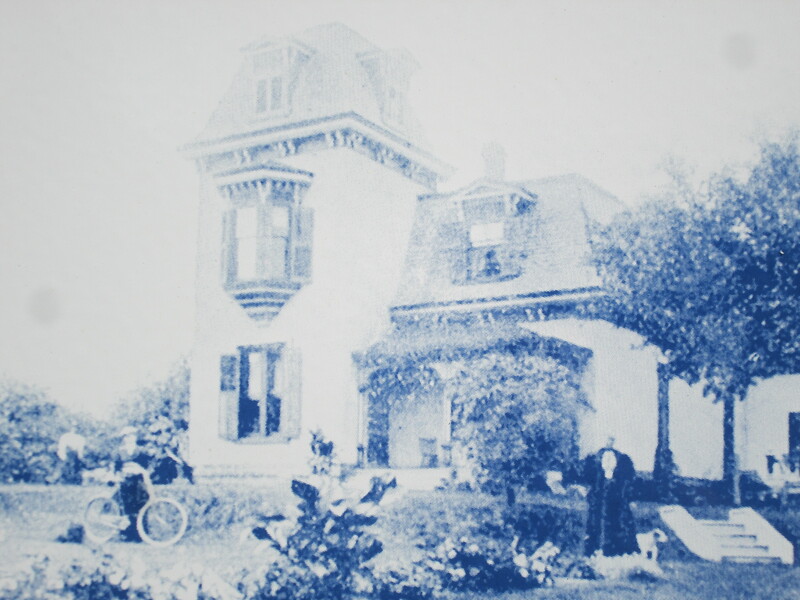 It is said that the spirit of a woman can be seen regularly at the house and spirits of a boy and an angry spirit of a man have also been uncovered by paranormal investigators. 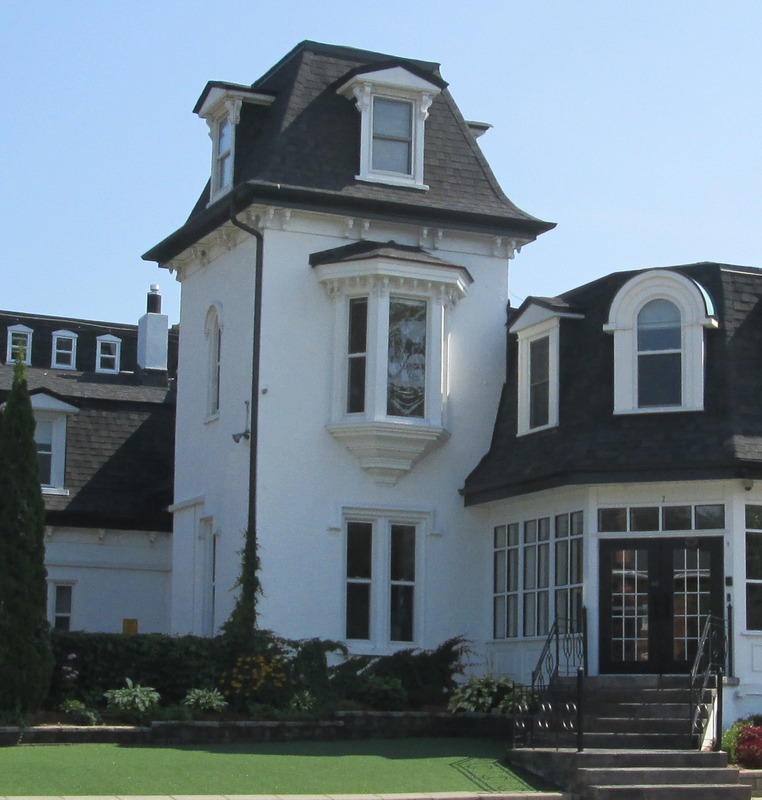 The house has been given a heritage designation in 1989 and currently is used as an event facility. 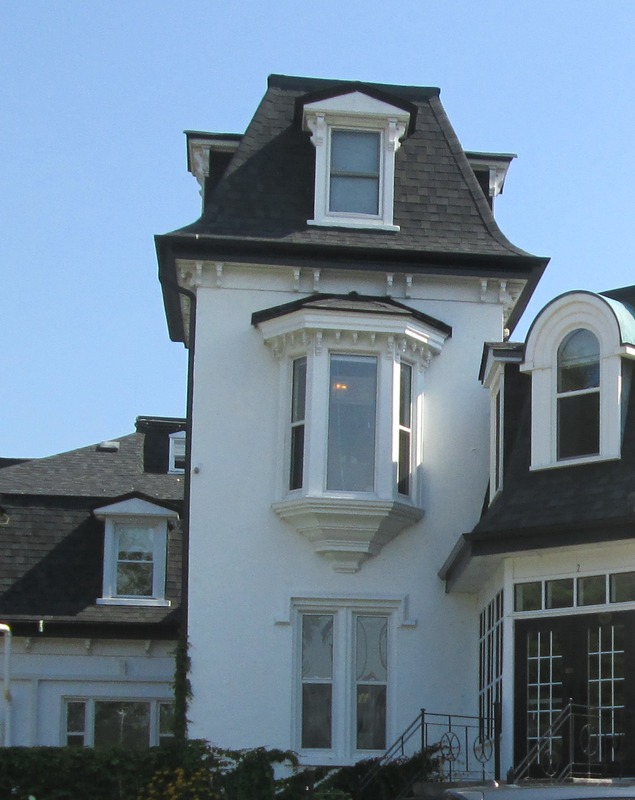 The house has been known as Holcim Waterfront Estate but it is being renamed Harding Waterfront Estate. The mouth of Joshua Creek has had a few pieces of armour stone dropped in to create a small break wall to provide some protection. 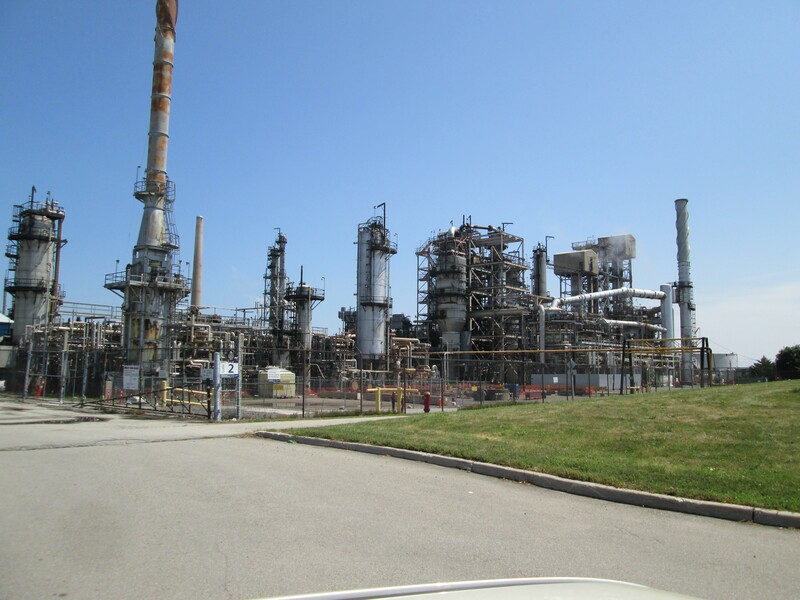 Looking to the east from the mouth of the creek you can see the Petro Canada refinery dock that extends 700 metres out into the lake. Equipment towers stand on the end of the dock to transfer oil from tankers. To the west, there is a brief shingle beach revealing the natural shoreline along this part of the lake. The point in the distance marks the beginning of the armour stone that has been applied to the shore in an attempt to slow down erosion. 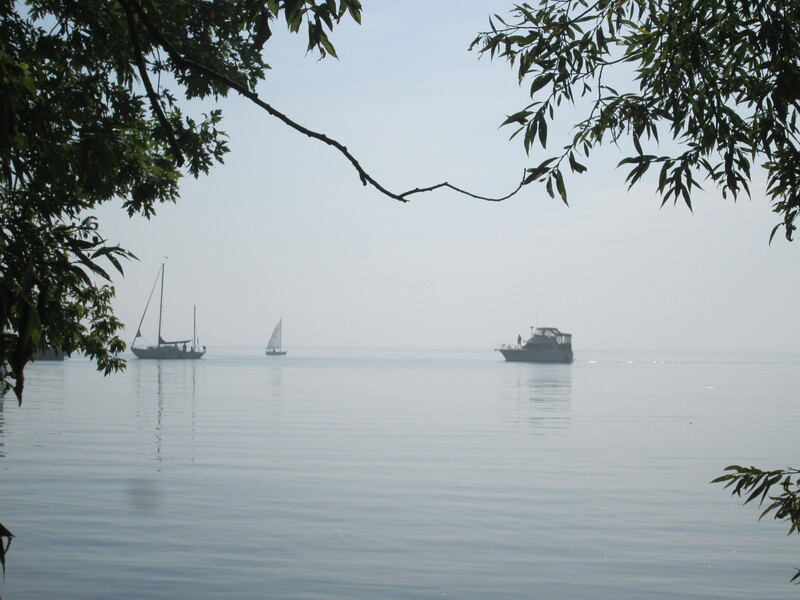 The lake was crashing into the chunks of limestone and sending spray high above them. Taking the upper trail on the return trip leads past the Oakville South East Waste Water Treatment Plant. The creek runs north from Breton Close as well, and hopefully, we’ll return next week and see what lies in that direction. This entry was posted in Joshua Creek, Uncategorized and tagged Canadian Beaver, Harding Waterfront Estate, Joshua Creek, Oakville, Snowdrops on March 29, 2017 by hikingthegta. On the side of Sixteen Mile Creek stand the remains of a memorial park that has been vandalized on multiple occasions. The scattered remnants stand abandoned waiting to see if they will fall victim to land developers or be restored as a public park. 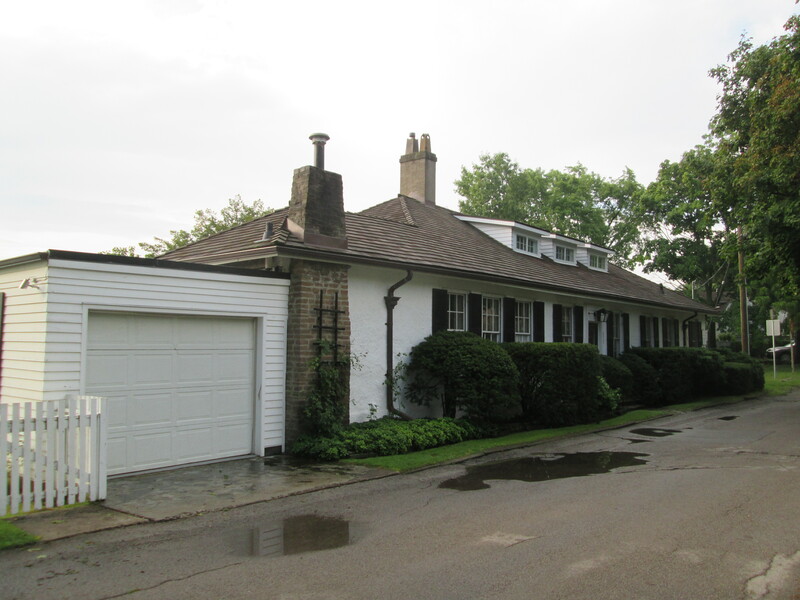 We parked on the fourth line where it dead ends south of Dundas Street and set out in the light rain and 6 degree temperatures. 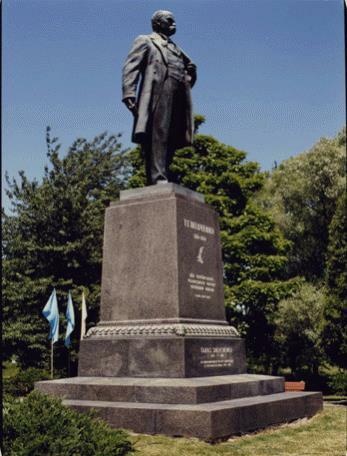 Taras Shevchenko was born in Ukraine in 1814 in the feudal system of the era. He was orphaned at the age of 11 and went on to become one of the country’s most prolific writers composing over 1000 works. Some consider him to be the Ukrainian version of Shakepeare. When his writing was seen as agitating against the czarists regime he was sentenced to serve in a military outpost and banned from writing. Although he could have lived in luxury from his work he chose to live humbly like the people he loved. He died in 1861 just the day after his 47th birthday. 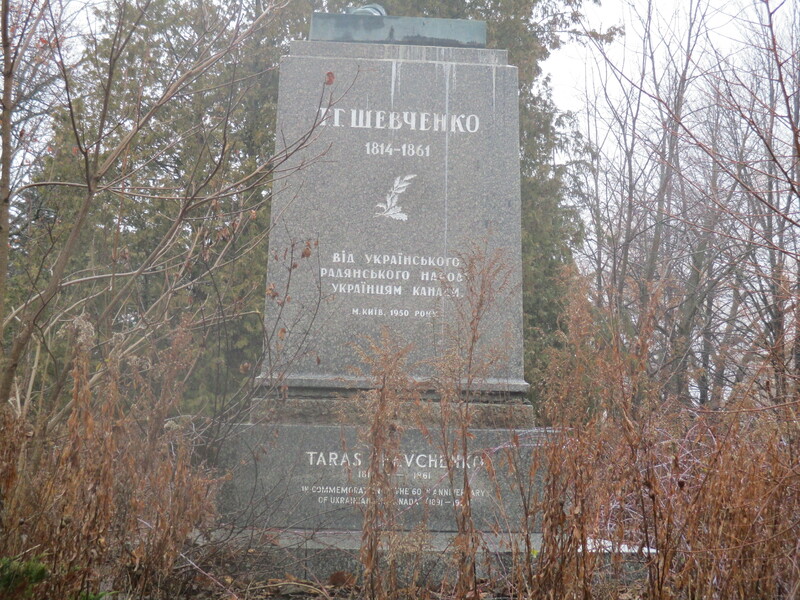 Ukrainians began to emmigrate to Canada in 1891 and by 1939 there was already a plan to erect a statue in honour of Taras. The Second World War prevented the community from getting things started but in 1950 it was picked up again. The plan was revised this time with a park and statue envisioned for the following year. Ten thousand people attended a performance in Maple Leaf Gardens on June 30th, 1951 which featured 1,500 performers. The following day the park was opened with up to 45,000 in attendance. An archive picture from the opening ceremonies is shown below. The 15 foot tall statue stood on top of a 70 tonne granite monument. It was a gift to Canada from Ukraine and was shipped here in 121 pieces which included the pedestal and garden stones. The total weight was 51 metric tonnes and the assembly work was completed by two local brothers. The statue was controversial from the start with a split between Communist and Czarist Russia causing the statue to be under 24 hour guard for some time after it opened. 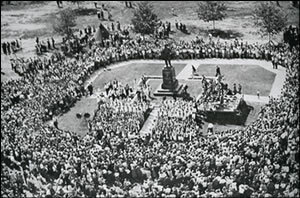 The Taras Shevchenko monument is seen below as it looked when the park opened on July 1, 1951. The Taras Shevchenko Museum opened a year later on July 1, 1952. It housed over 500 exhibits, mostly from the museum in Kiev. It included 23 of Taras’ oil paintings as well as carvings and Easter eggs. On September 16, 1988 the museum was destroyed by an arson. The death mask, an original bronze copy of the mold was the only thing rescued from the museum. 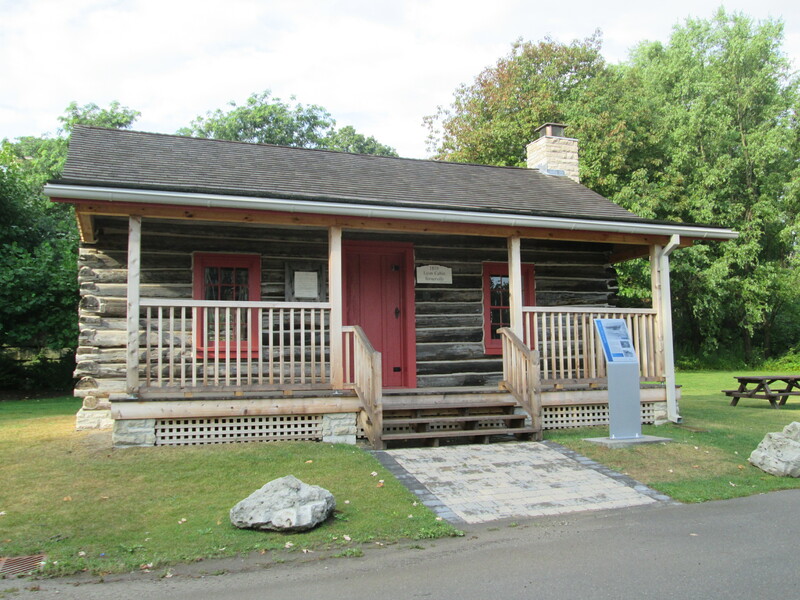 It has been moved to the new museum which was opened at 1614 Bloor Street W. Today an old sidewalk runs to the field where the museum stood until 27 years ago. 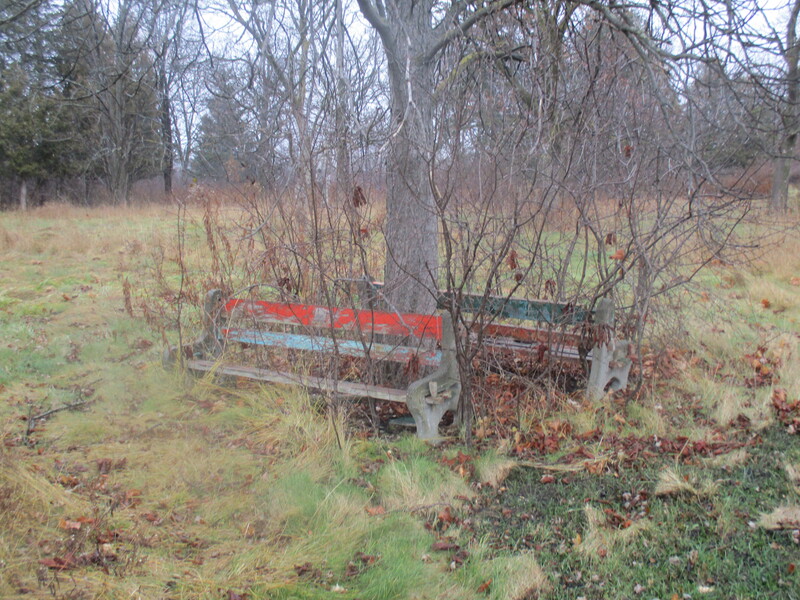 Park benches are scattered around the formerly landscaped park. 16.5 acres were planted with over 600 trees and 500 pounds of grass seed. The grass near the bench shows signs of a recent grass fire that threatened to consume the remnants of the park. 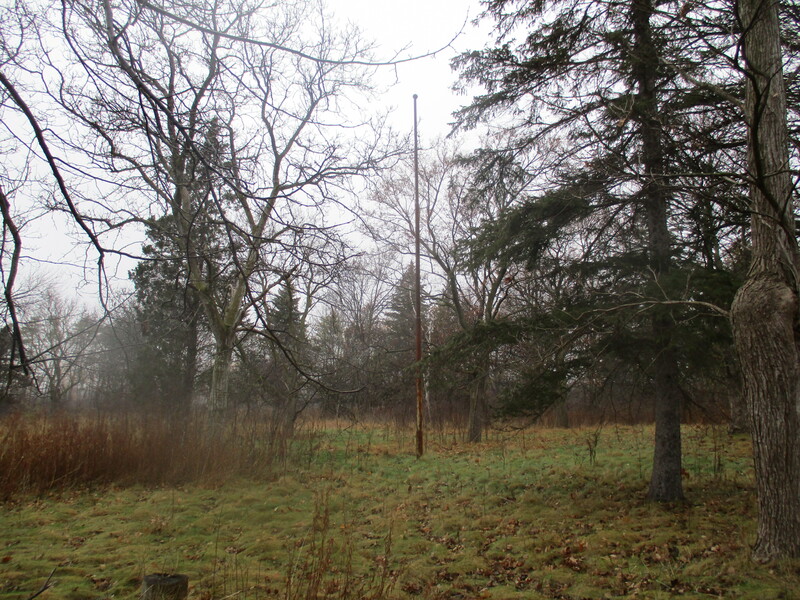 The old flag pole still stands in the open field near the monument. Sometime around Christmas 2006 thieves drove a truck up to the statue. They attached ropes to the statue using a ladder stolen from the caretaker’s property and pulled it the ground. 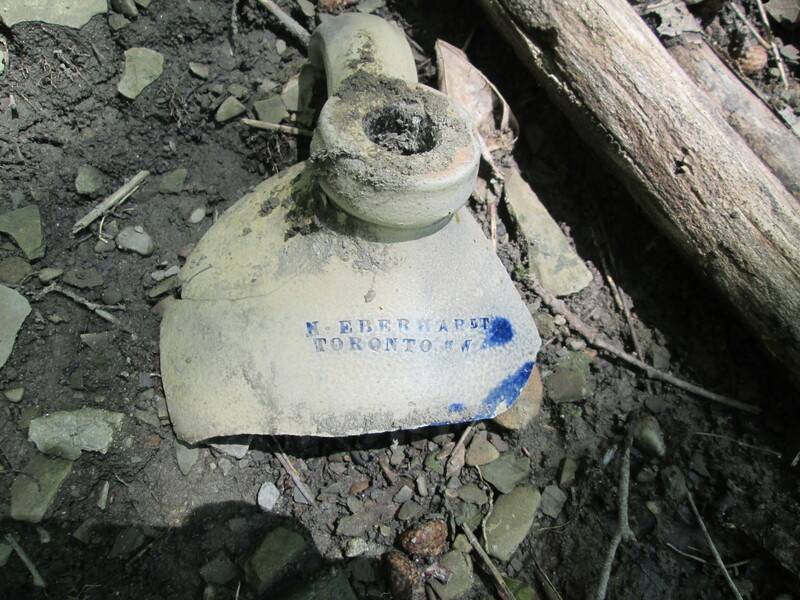 The scrap value was estimated at $20,000 by police and only the head was recovered. It alone weighs 170 lbs and has been placed in the new museum on Bloor Street. There was a smaller statue of Taras sitting in a chair reading a book near the entrance to the park but it was stolen in 2001 just a few days after the July 1st celebration of the park’s 50th anniversary. There also used to be ornate iron gates that welcomed visitors off of Dundas street but they too appear to have been stolen for their scrap value. The cover photo shows the entrance to the park with the broken monument in the background. Even the granite marker naming the park has been vandalized by graffiti. We followed the trail to where an old access road leads down to the level of Sixteen Mile Creek. There is a limited range one can travel upstream on this side before you must climb the ravine to cross a shale cliff. Near here is an old pump house on the side of the creek. There are intake pipes in the river as well as pipes running to the top of the hill. 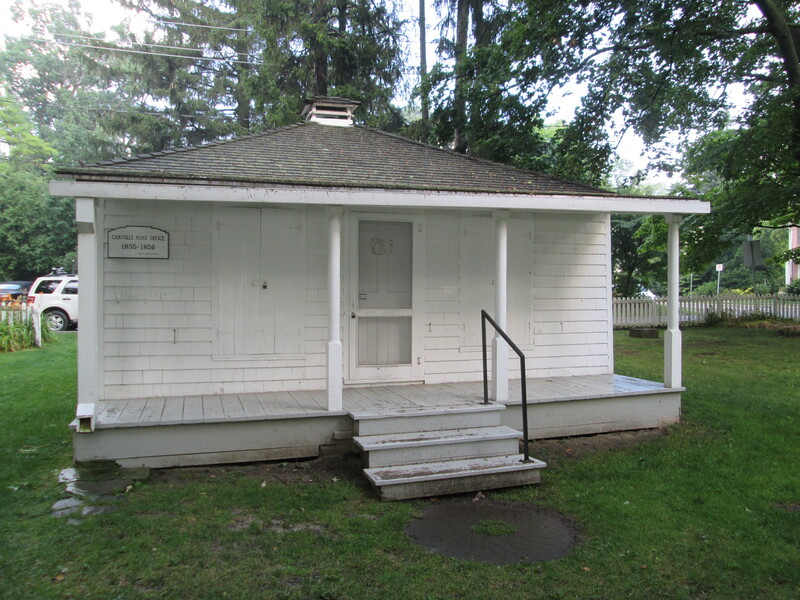 The pump house appears to have been associated with a children’s campground that occupied 47 acres adjacent to the Memorial Park. The children’s campground was closed in 1998. 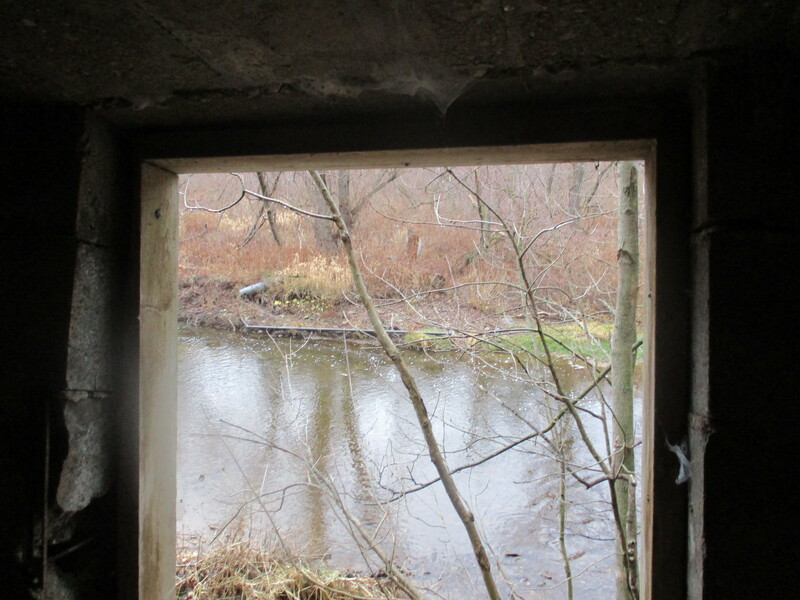 The picture below shows the view through the open door facing the creek. Pieces of PVC pipe can be seen on the far embankment and in the water. The eastern red-backed salamander lives in woodlands and is considered to be the salamander species of least concern for preservation in Southern Ontario. They typically breed in the fall but can also breed in the spring. They can reach population densities as high as 1,000 salamanders per acre. This salamander has a short hibernation period compared with other salamanders and have been known to be seen even in winter. The slow start to the winter season this year seems to have kept this one still active. 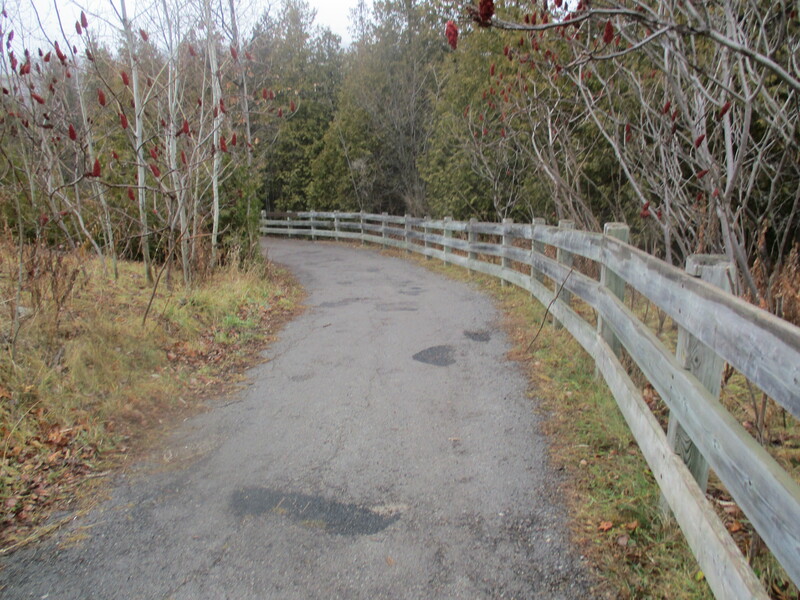 Before the current Dundas Street bridge was built the road used to climb the side of the ravine in a switchback that connected with the fourth line. That road was closed to traffic and now provides a link to the hiking trails. 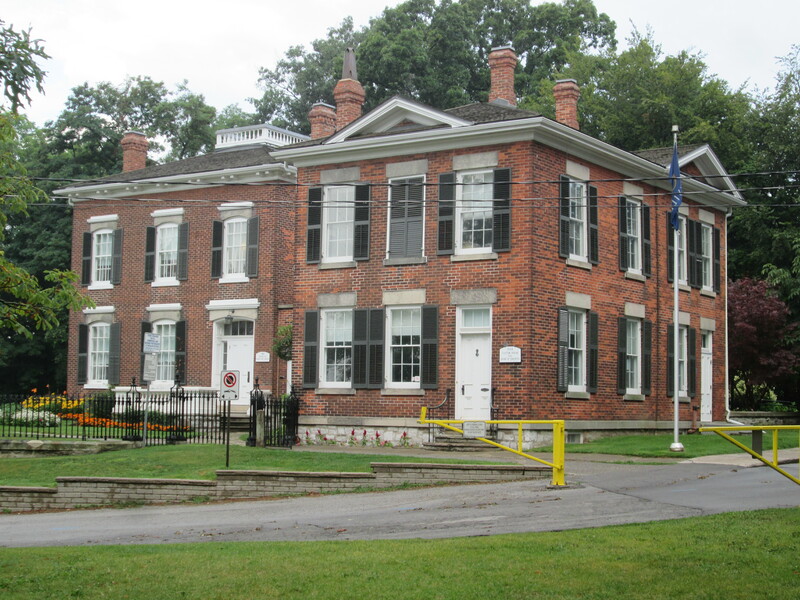 We previously visited this site when investigating the Ghost Town of Sixteen Hollow. 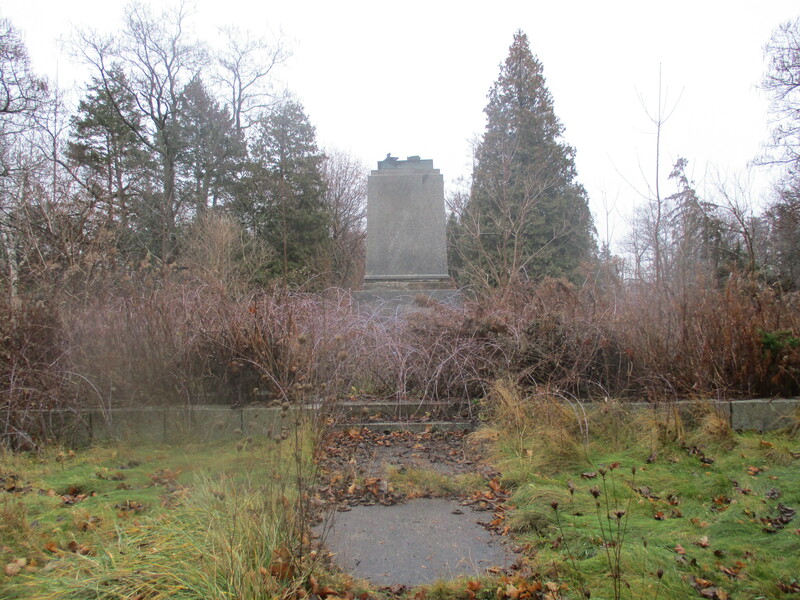 The future of the Taras Shevchenko memorial park is uncertain. 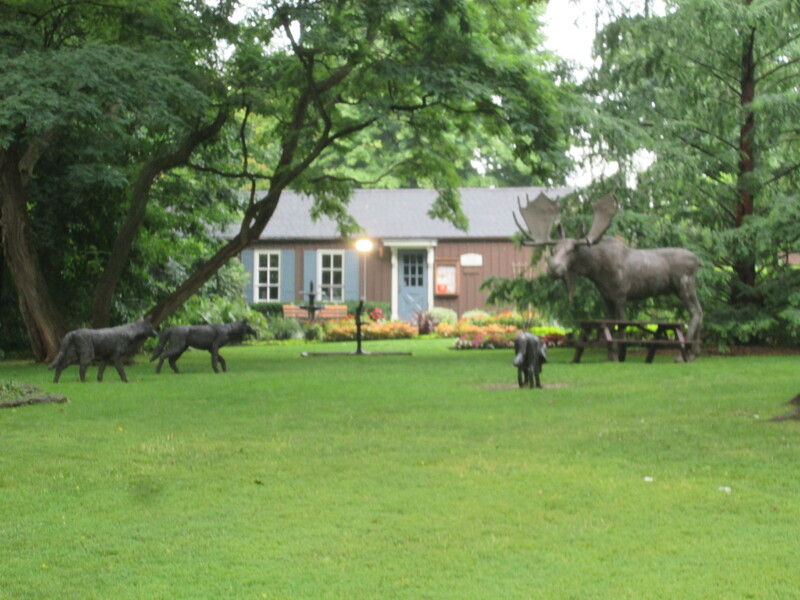 The park owners had been in negotiations with the City of Oakville to donate the property as a city park when the statue was stolen. At the same time the surrounding land from the children’s camp has been bought by developers who plan 205 single family homes and 125 townhouses on their land. 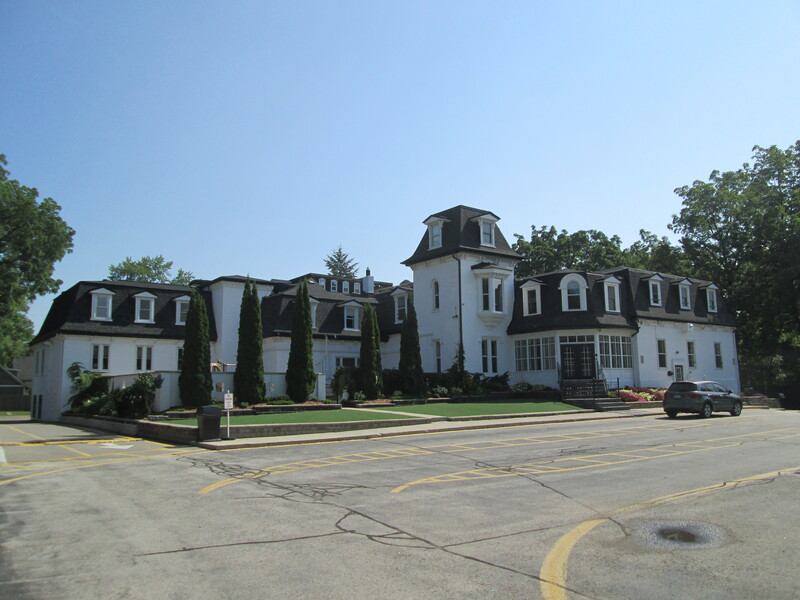 They have been actively trying to acquire the memorial site for part of their development. I’m not sure what is in store for this repeatedly vandalized memorial. 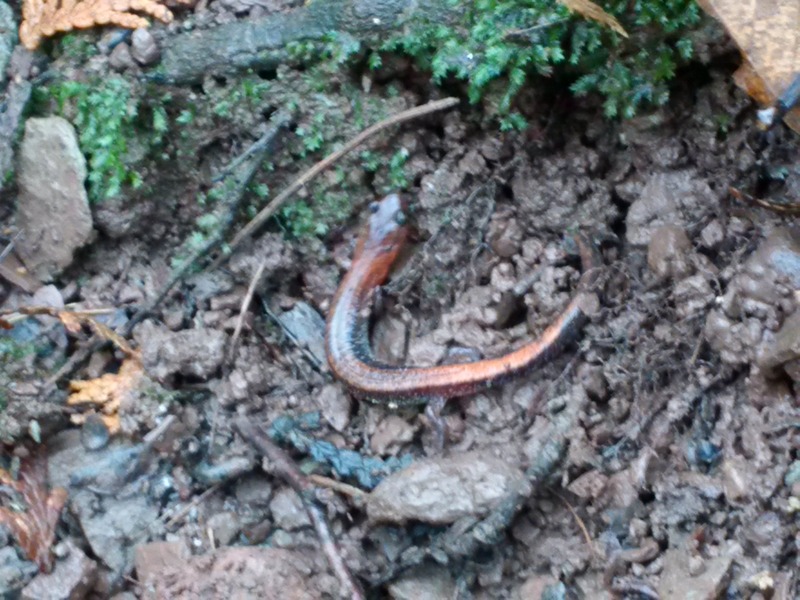 This entry was posted in Sixteen Mile Creek and tagged Memorial Park, Northern Red-backed Salamander, Oakville, shecvhenko museum, Sixteen Mile Creek, Taras Shevchenko on December 15, 2015 by hikingthegta.